The Gray Iron Fitness Newsletter, Issue #030, Retirement Bliss. In today's November 21, 2009 newsletter . . .
By the time we reach the mid-century mark in life, retirement planning should be in place — even if we never intend on retiring. If you love what you are doing, why stop because of some age number? The important thing is having the option to retire should you choose to. But also keep in mind that unforeseen events and circumstances may require leaving your work, no matter how much you would prefer to continue. Or, over the years a change in your attitude and priorities may evolve. No one can be 100 percent certain how these things will play out. Just knowing that you have the option to do as you wish is a wonderful thing. A couple of factors are imperative if you want to enjoy such options: 1) You must have good physical and emotional health; and 2) your financial condition must be sound. If you squander either, the second half of your life will not be pleasant. The earlier in life we begin living a financial and physical fitness lifestyle the better our odds of discovering that the senior years may be the most rewarding time of all. And, to be blunt, the other extreme of being in poor health and broke can be a miserable existence. So of course the sooner we understand these facts and act on them, the better off we will be. Yet even for those who act late in life, some measure of improvement is still possible — at any age. 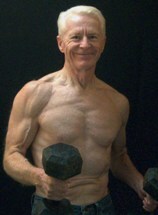 Most of the Senior Exercise Central website is dedicated to strength, physical fitness and health. Today, I’m asking that you treat yourself to some ideas on . . . I promise you will not be disappointed in what you find. And if it stirs you to act on something you may have been putting off, you will be delighted. It is guaranteed. Training to failure on any kind of regular basis always seemed to me like a bad idea, especially for seniors. I’ve tried it a few times and found that it soon takes its toll on my mind and body. I simply cannot sustain pushing myself to the absolute limit workout after workout. The other day I was looking at an article in Men’s Health magazine and the author described two different types of training to failure. One type is training to absolute failure, and the other type is training to technical failure. He defined training to absolute failure as not being able to complete another exercise repetition - no matter what. While training to technical failure is that point when your body posture must change to complete the movement. In other words, when you have to cheat by leaning or swinging forward or back, or you can’t control the speed of the weight you are lifting. Now that makes a little more sense to me than going to aboslute failure. Still, I always liked what Bill Pearl says about the concept. I’m paraphrasing, but Pearl says to end a set when you could do one or two more reps, if you really had to. Finish your workouts leaving a little gas still in the tank. "Train don't strain" used to be the advice in the old muscle building courses. Still today, that’s pretty good advice.